The greenhouse gas emissions cut in 2011 is good news, however, it was largely due to a warmer winter. Nonetheless, the EU is making clear progress towards its emission targets. The European Union’s total greenhouse gas emissions in 2011 were 18.4 % below 1990 levels, according to the EU greenhouse gas inventory. When international aviation is included, in line with the climate and energy package, greenhouse gas emissions fell 17 % in the EU since 1990. Why were greenhouse gas emissions lower? The 2011 emissions decrease was largely due to a milder winter in 2011 compared to 2010, which led to a lower demand for heating. The officially reported 2011 emissions were 3.3 % lower than the previous year, while the EU experienced a 1.6 % growth in GDP. The reduction in emissions is larger than EEA’s estimates published last year, because the extent of the reduced heating demand only became apparent when complete and final energy data became available. The highest emissions reductions were from homes and commerce. Almost two thirds of the emissions reduction in 2011 came from the United Kingdom, France and Germany. The largest increases in the absolute volume of emissions were in Romania, Bulgaria and Spain. Fossil fuel consumption decreased by 5 % in the EU. However, the average carbon intensity of the fossil fuels used increased, with solid fuel consumption, such as hard coal and lignite, rising by almost 2 % between 2010 and 2011. Liquid fuel consumption decreased by 4 % and natural gas consumption fell by almost 11 %. Biomass combustion increased by less than 1% in EU-27 in 2011. Consumption of energy from renewable sources had the second largest decline of the last 21 years in percentage terms, mainly due to significantly lower hydroelectricity production. Wind and solar, however, continued increasing strongly in 2011. Nuclear power’s contribution to electricity also declined in the EU in 2011 compared to 2010, mainly due to closure of power plants in Germany, according to Eurostat energy data. Road transport emissions continued to decline in 2011 for the fourth consecutive year. In contrast, emissions from international aviation and shipping increased in 2011. The official EU greenhouse gas inventory for 2012 will only become available in late May 2014 and will be officially submitted to the UNFCCC by the EU. As with this year, it will be the result of a compilation made by the EEA on behalf of the European Commission, in close collaboration with the EU Member States, the EEA’s European Topic Centre on Air Pollution and Climate Change Mitigation (ETC/ACM), the European Commission’s Joint Research Centre (JRC), Eurostat and Directorate-General Climate Action (DG CLIMA). Greenhouse gas emission trends In 2011, EU-27 greenhouse gas emissions decreased by 3.3 % compared to 2010. This was mainly due to the milder winter of 2011 in many countries, leading to lower heating demand from the residential and commercial sectors. In general, emissions from natural gas combustion fell, while emissions resulting from solid fuel consumption increased due to higher coal consumption in 2011 compared to 2010 levels. This decrease in emissions continues the overall decreasing trend since 2004, with the exception of 2010, when emissions temporarily increased due to increased economic growth in many countries coupled with a colder winter. 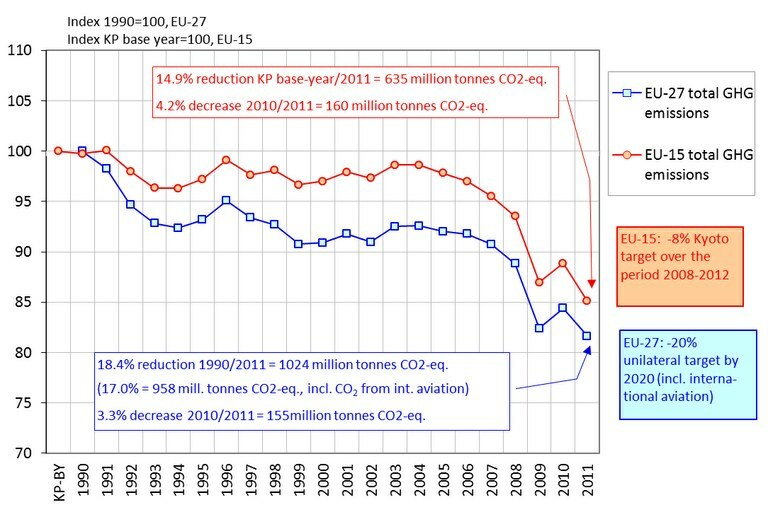 With respect to 1990 levels, EU‑27 emissions have decreased by 18.4 % ( Figure 1 ). At a sectoral level, emissions decreased in all main emitting sectors except transport and production and consumption of fluorinated gases (F-gases), where they increased considerably in percentage terms. CO 2 emissions from public electricity and heat production decreased by 15.9% compared to 1990. In the EU-15, 2011 GHG emissions decreased by 4.2 % compared to 2010 – a decrease of 159.6 Mt CO 2 - eq in absolute values. This implies that EU‑15 greenhouse gas emissions were approximately 14.7 % below the 1990 level in 2011 or 14.9 % below the base-year level. CO 2 emissions from public electricity and heat production are also decreased by 9.3% with respect to 1990. The European Union remains well on track to achieve its Kyoto Protocol target (an 8% reduction of its greenhouse gas emissions compared to base-year level, to be achieved during the period from 2008 to 2012). A detailed assessment of progress towards Kyoto targets and 2020 targets in Europe is provided in the EEA's 2012 report on Greenhouse gas emission trends and projections and will be updated in October 2013. For references, please go to https://www.eea.europa.eu/media/newsreleases/greenhouse-gases-2011-emissions-lower or scan the QR code.